This CARAT* London Willa Heronie Ring is crafted in sterling silver with a white gold finish with a stunning, geometric design. All CARAT* London products come with a 1 year warranty. 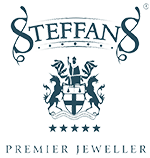 Feel free to call a member of our team at 01604 622090 or e-mail online@steffans.co.uk. We will be more than happy to assist you! Call us for more information on availability of sizes at 01604 622090.